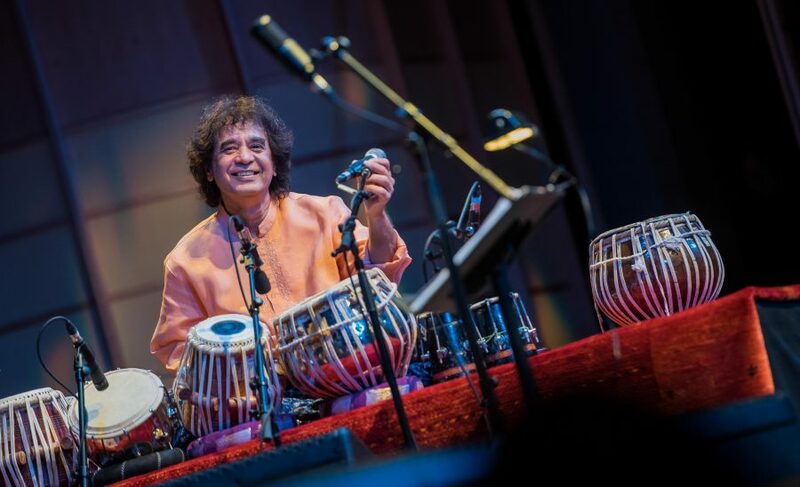 Of the thousands of artists who have performed at the Chan Centre over the past 20 years, few have appeared alongside as diverse an array of musical configurations as tabla master Zakir Hussain. Born in Mumbai and based in San Francisco, Hussain is revered around the world for his virtuosity and his mesmerizing live performances. Just as exceptional is his adaptability: at the Chan Centre alone, the veteran musician has appeared with Celtic all-stars including Scottish fiddle player Charlie McKerron; banjo icon Béla Fleck and bassist Edgar Meyer; groundbreaking Indian musicians Rakesh Chaurasia, Sabir Khan and his brother Fazal Qureshi as part of the Masters of Percussion project; and jazz luminary Dave Holland with legendary Bollywood composer and vocalist Shankar Mahadevan for Crosscurrents. Venues like the Chan Centre are crucial to artists, he says, because they allow for experimentation in a way that far larger or less flexible venues cannot. The venue also helps music students to grow, he adds, because it allows them to get a feel for a professional stage, and introduces them to touring artists from around the globe. Hussain himself has wowed dozens of UBC students with class visits and workshops, offering invaluable advice and encouraging students to keep learning and expanding their own musical horizons. Like most musicians who play the Chan Centre, Hussain is impressed by the concert hall’s exceptional acoustics — but he says the venue’s intimacy makes the experience all the more extraordinary.